Quantity: For each canner load of 7 quarts, you need an average of 19 pounds of whole apples. For each canner load of 9 pints, you need an average of 12-1/4 pounds of whole apples. Quality: Select apples that are juicy, crisp, free of insect damage and heavy bruising. Use a mixture of both sweet and tart apples. Place drained apple slices in a large saucepan and add water or very light, light or medium syrup (See Syrup Pack). Use1 pint of liquid per 5 pounds of sliced apples. Boil five minutes. Stir occasionally to prevent burning. 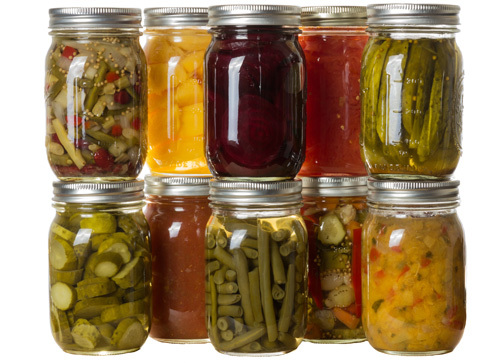 Fill jars with hot slices and hot syrup or water; leave 1/2-inch headspace.